Customers taking advantage of energy-efficiency programs saved 20,761,200 kilowatt hours of energy last year – enough to power about 1,000 homes in Chelan County. 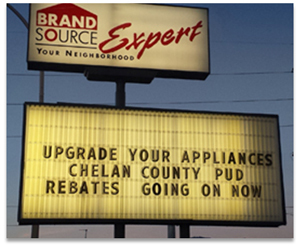 The savings helped Chelan County PUD surpass its 2013 conservation goal by about 40 percent. Some 1,890 homeowners took advantage of programs to save energy and money including rebates on appliances, windows, insulation and ductless heat pumps; duct sealing for manufactured homes; and refrigerator/freezer recycling. Thirty-five businesses installed energy-efficiency improvements with help from the PUD. And 94 low-income households received weatherization help using PUD funding through the Chelan-Douglas Community Action Council. Surveys of customers who participated in programs last year showed high satisfaction with their products and PUD customer service. There’s still time to participate this year as all programs are continuing. Check them out here. This entry was posted on Monday, February 3rd, 2014 at 4:18 pm	and is filed under Appliances, Energy conservation, Heating and cooling, Lighting. You can follow any responses to this entry through the RSS 2.0 feed. Both comments and pings are currently closed.